How do you distinguish one brand of outdoor patio furniture from another? Years in production? Materials? Popularity? Price? We've compiled a handy guide featuring the top brands, companies, and manufacturers in outdoor furniture. This allows you to explore each company's website to learn more about the latest collections, other products, and where you can buy them. Most sites include information on registration, returns, warranties, care, and maintenance. The brands featured can usually be found at patio and garden retailers or online and are more of the high-end products that are built to last, provided you follow instructions for care and storage off season. In the industry, products are known as casual furniture and can be used for both indoors and outdoors. Some consumers like to use outdoor furniture inside because it's made with materials that are sturdy and built to last, including stain-resistant fabrics. Something to consider if you have children at home who are as neat and tidy as most normal kids. About: The company makes outdoor furniture and dining sets, along with fire pits and tables. Pictured: Apricity Outdoor's Del Mar woven deep seating collection is made of hand-woven all-weather wicker and rust-resistant aluminum frames. 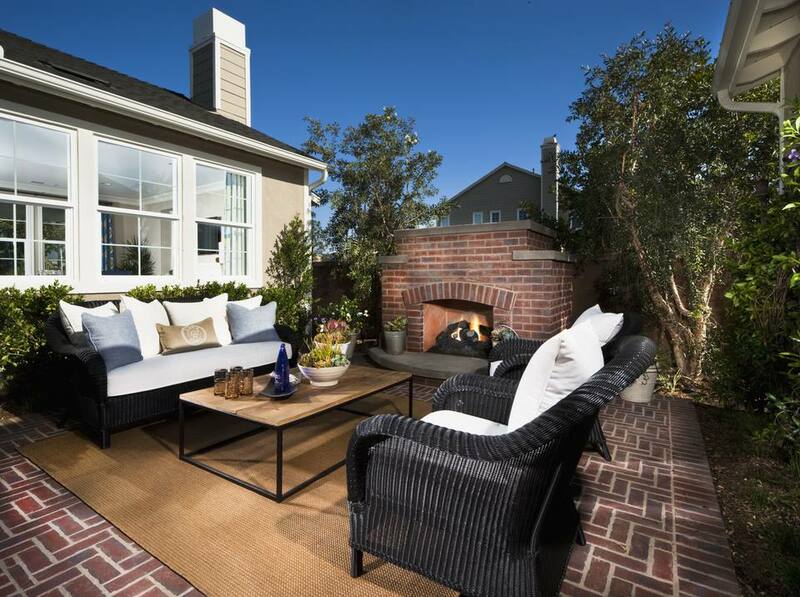 The collection includes a fire pit with table space and an armless chair that features open and closed wicker weaves. Cushions are made of Sunbrella fabric and quick-dry foam. About: Founded in 1975, Braxton Culler is known for its wicker and rattan indoor and outdoor furniture, along with other pieces for every room in the house. Pictured: Swivel rockers and a round table are featured from the Brighton Pointe collection. Other pieces include a chaise, tables, and sofa. About: Pasadena, California, seems to be where at least a few of the big names in outdoor patio furniture got their start. Think about it: the sunny climate, home of the Rose Parade and Rose Bowl, it was a winter destination for wealthy easterners in the early 1900s. Brown Jordan began in 1945 by Robert Brown and Hubert Jordan in Pasadena. The first pieces were made of tubular aluminum and vinyl lace and referred to as "leisure" furniture. Today, the company has features dozens of collections in a range of design styles and material for residential and contract environments. Pictured: Designed by John Caldwell, the Chippendale-inspired Calcutta collection features a lattice bamboo pattern on pieces like deep-seating furniture, a chaise, tables, and outdoor dining chairs. The collection is available in a variety of finishes and upholstery colors and patterns for a personalized look. 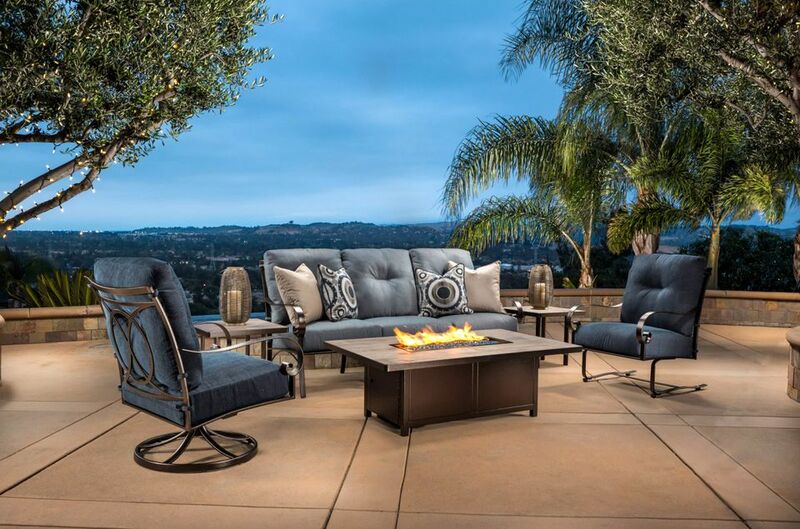 About: Started by a father and his sons in Southern California in the early 1990s, Cast Classics makes cast-aluminum and wicker-finish outdoor furniture. In addition to patio furniture, the company makes umbrella bases, carts, and bars. Pictured: The Sutton set is Inspired by Midcentury Modern designs. It combines hand-forged aluminum frames with hand-woven synthetic wicker. Deep seating pieces are are low to the ground with thick, comfortable cushions. About: For more than 40 years, Castelle has been making high-quality outdoor furnishings from intricate aluminum castings or extrusions and artisan-applied antiquing to all-weather pillows and cushions. Pictured: Geometric tile carvings inspired Castelle's Barclay Butera Signature Collection. Pieces include dining, occasional tables, day beds, chaises, and deep-seating cushioned pieces in Barclay's trademark navy and white—always a smart and classic look. About: Founded in 1988, Ebel Inc. produces aluminum and all-weather wicker that is 100 percent recyclable. In 2008, Ebel partnered with Trees for the Future and is certified by the Forest Stewardship Council (FSC). Pictured: Proving that some collections can be mixed for just the right look, this arrangement features pieces from the Avallon collection in Ebel's Hickory finish, including club chairs, a club swivel glider with canvas cushions and Twist Smoke Pillows. The end table and coffee table are part of the Lago collection. About: Established in 1993, Hanamint makes outdoor furniture in a variety of metal finishes. Pieces include dining and deep seating sets, fire pits and accessories. Pictured: The Stratford Estate Club deep seating set. Other pieces in this collection including swivel chairs, club chairs, ottomans, dining furniture, and seating that can be grouped for a customizable sectional. About: The company got its start in 1906 when Marshall B. Lloyd opened the Lloyd Manufacturing Company in Menominee, Michigan. There, Lloyd invented a unique process for making fine woven furniture, which became Lloyd Loom. In 1982, Don and Dudley Flanders bought Lloyd Manufacturing from Heywood-Wakefield to form Lloyd Flanders and started making contemporary loom furniture durable for outdoor use. Pictured: Designed by Mathias Hoffman, the Tobago collection is a woven collection with Antiqued Teak tops. Pieces include a cocktail ottoman, loveseat, rocker lounge chair, sofa, and a round barrel end table. About: For more than 50 years, Mallin has produced outdoor furniture constructed of heavy-gauge tubular, extruded or solid aluminum frames and polyester powder-coated finishes. Furniture includes club chairs, chaises, dining sets, sofas, fire pits and bar carts. Pictured: The contemporary Madeira Cushion collection features deep-seating that create a sectional, including armless and corner chairs, a swivel lounge chair, chaise, and ottoman. About: The company began in the early 20th century when B.M. Meadow founded the Birmingham Ornamental Iron Co. in Birmingham, Alabama. During World War II, the company starting producing a line of metal furniture. By the 1950s, the company was the third-ranked wrought iron furniture company in the United States. The company continues to grow, and in the outdoor market offers dining groups composed of action chairs, stack chairs, dining tables, bistro groups, and accent tables, chaises, gliders, bakers' racks, and tea carts, cushions and umbrellas; and garden products. Pictured: The charming vintage Southern-inspired Athens collection includes a chaise with swing-out arm, a club swivel rocker, loveseat, sofa, cuddle chair, and cocktail ottoman. About: In 1947, Oddist W. Lee established a company in Pasadena, California, starting out as a wrought-iron gate company for luxury homes in the area. Local patio furniture dealers requested that Lee make high-end outdoor furniture. In 1954, the OW Lee Companywas incorporated. Still family owned and operated, OW Lee makes its outdoor patio furniture from carbon and galvanized steel and alloy aluminum. Each furniture piece receives a hand-applied zinc-rich epoxy primer and a top coating of durable polyurethane powder. Pictured: The transitional Pasadena collection features the company's new Flex Comfort system on dining and chaise pieces. Pasadena includes counter and bar stools, chaise lounges, swivel rockers, loveseats, and an ottoman. Pictured: The Ashbee Sectional Cushion collection includes marine-grade polymer-top tables, arm and armless chairs, and various sectional pieces. About: If you ever meet a suave, debonair guy at a tiki bar named Tommy Bahama and he tells you he owns the lifestyle brand of clothing, furniture, and restaurants, be wary. There is no actual guy named Tommy Bahama. Or, if there is, he doesn't own this company. The lifestyle brand features clothing and home furnishings. Every item is handcrafted, featuring artisan finishes and fabrics that reflect the intrigue of the islands. Pictured: The Misty Garden collection features an ivory finish and French botanical styling. Pieces​ are created in cast aluminum and feature a classic quatrefoil pattern with custom porcelain tops. Pieces in the collection include dining, deep seating, and a variety of tables. About: In 1954, retired engineer M. Baker moved to Sarasota, Florida, where he bought a small, local company—the Sarasota Redwood Furniture Company. Experienced with aluminum from working in the aircraft industry, Baker switched from redwood to welded aluminum for his outdoor furniture construction. He renamed the company Tropitone. Now located in Florida and California, Tropitone collaborates with fabric designers to select continuously-updated line of more than 200 outdoor fabrics. All fabrics have been rigorously tested for durability and weather resistance. Pictured: Peter Homestead designed Tropitone's Kenzo Cushion collection features modular pieces that can be customized for your needs and depending on the size of your outdoor space. About: Since 1975, the company has specialized in quick-ship special orders. Each year, Winston offers approximately 30 collections in a dozen finishes and more than 500 fabrics. Products include outdoor deep seating and dining sets, chaise lounges, fire pits, umbrellas, throw pillows, and balcony chairs. Pictured: The Belvedere Cushion deep seating collection is a transitional design that features extra-wide multidimensional extruded aluminum frames. Cushions feature pillow backs and "kidney cushion" lumbar support. Welting fabric (piping along edge of cushion) can be ordered in a coordinating or contrasting fabric. About: In 1866, Lyman Woodard founded his namesake furniture company. In the 1930s, the Woodard family developed the first collection of hand-crafted wrought iron furniture. This led to outdoor furniture made from other materials, like cast and tubular aluminum. Today, Woodard offers a variety of products made from wrought iron, aluminum and all-season wicker. Pictured: While it looks like rattan, the Cane collection is made of extruded aluminum with a power-coated finish. A variety of fabric options are available for deep-seating cushions and pillows.